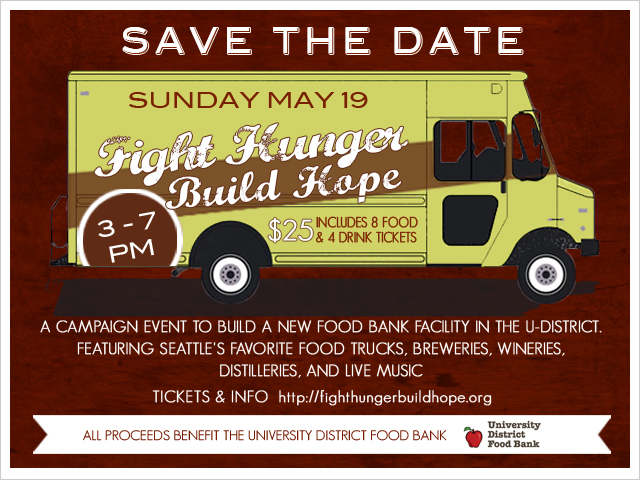 I’m excited to announce Food Truck Roundup!, an event celebrating the 30 year anniversary of the University District Food Bank and official kickoff of our Capital Campaign, Fight Hunger build hope, to construct a new facility. In 1983 the food bank provided food to 50 families a month. Today on average we distribute groceries to 1100 different families a week in the same 800 square foot facility. It’s time for a change! Fight Hunger build hope is a three year $2.75 million project to greatly expand our distribution and storage capacity and enhance our ability to provide nutritious meals to families in need. Where: Phinney Neighborhood Community Center, 6532 Phinney Ave N.
Tickets: $25 per person which includes eight food tastes and four drink tastes. Buy tickets here! Note: to comply with state law, this event is only open to those ages 21 and over. Tastes from some of Seattle’s most creative and innovative food truck chefs including Skillet Street Food, Barking Frog’s Mobile Kitchen, Contigo, Crisp Creperie, Chopstix, Veraci Pizza, Hallava Falafel, Street Treats, Seattle Biscuit Company, and more!